Succotash is a great summer side dish. Corn, beans, and tomatoes, and other summer vegetables are in full swing, making it a great go to for putting meals together for the family. Succotash has been around for a long time, having originated as a Native American dish. The two key ingredients of a standard succotash are corn and beans. Traditionally, Lima beans are used, but any bean will do! Think of pinto beans, black beans, kidney beans, cow peas, northern white beans, Roman beans, mixes of all beans! vitamin B6 to the table, which aids in brain chemistry as well as helps stabilize our natural sleep/wake state. 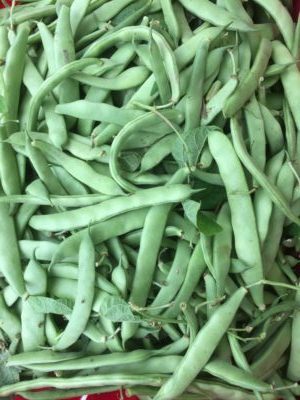 All beans are generally high in folate, which is excellent and important for women trying to conceive, and those who are pregnant. Furthermore, folate is great for the maintenance of healthy cell production. Beans also have manganese and thiamine which both play a role in maintaining a healthy metabolism. Lastly, beans are full of fiber with a little protein, which help us stay fuller for longer and aid in our digestion. When paired with a grain like rice or bread, succotash provides a meal with a complete protein for those who don’t consume meat. Topped with herbs, this succotash is an excellent side to grilled chicken, poached or fried eggs, steak, or fish. Try dicing up a summer squash, or zucchini and tossing it in. Like peppers? They add color, flavor, and nutrition. Be creative with what’s in season to jazz up your succotash! Heat your oil or butter in a large skillet over medium heat and add the cut red onion. Saute 1-2 minutes and add the cherry tomatoes. Cook down for 5-7 minutes. Once the tomatoes have begun releasing their juices and the onions are becoming soft, add the shucked corn kernels and beans. Cook for an additional 2-3 minutes or until the corn is fully cooked through. Season with salt, pepper, and/or fresh herbs. Tell us about what you’re making – we’d love to see and share! Beets are abound this time of year. They’re beautiful, robust, and earthy. I’ve talked to many folks who carry them home in their market baskets simply because they’re gorgeous, yet don’t know how to prepare them. I can assure you, cooking beets is relatively easy, albeit a little messy. Red beets especially can stain clothes (it’s used as a natural food dye! ), so be sure to wear an apron. I also recommend using food handler gloves if you’re worried about staining your hands. There are a bunch of ways to cook beets, obviously. If you’re looking for easy-peasy, then I’d say roast them. I find by roasting beets you maintain both flavor and texture. Peeling and cutting the beets into mostly uniform sized pieces is the brunt of the work. Generally, I leave small beets (1” diameter) whole, cut medium beets (2”-3 ½”) in half, and quarter beets that are greater than 4” in size. From there, the sky’s the limit! I like to toss them in a little extra virgin olive oil, just to coat, with a little salt and pepper. I scatter them on a baking sheet lined with parchment paper and pop them into a preheated 400F oven and begin checking them after 20 minutes, depending on the size. I check them every 5-7 minutes thereafter forking one into my mouth and checking for doneness “the old fashioned way”. Once they’ve reached a blissful texture, remove them from the oven and let them cool. From that point on you can add them to any number of dishes, or eat them perfectly as they are. Now, you may be thinking: “It’s 90 degrees out. I’m not going to preheat my oven to 400F!” – and no one would blame you! Another really simple way of cooking beets is to boil them stove top. I love doing it this way for when I quick-pickle beets. If the beets are fairly large (4” or more in diameter), I like to cut them into quarters. Leave the skin on! You can easily peel it off after they come out of the cooking liquid. If the beets are little, I just leave them whole. I also think this makes for really pretty presentation later. Bring the liquid to a simmer and place the beets in, either cut or whole making sure they’re all of similar size. Check for tenderness after about 15 minutes and every 5 minutes thereafter. Once easily pierced with a knife to the center, remove the beets from the liquid, cool, and store. I like to cool the poaching liquid and store the beets in it. As is, or tossed with a little fat and seasoning, beets make a beautiful and nutritious addition to any meal. After cooking the roots themselves, consider sauteing the greens and mixing the beets back in! 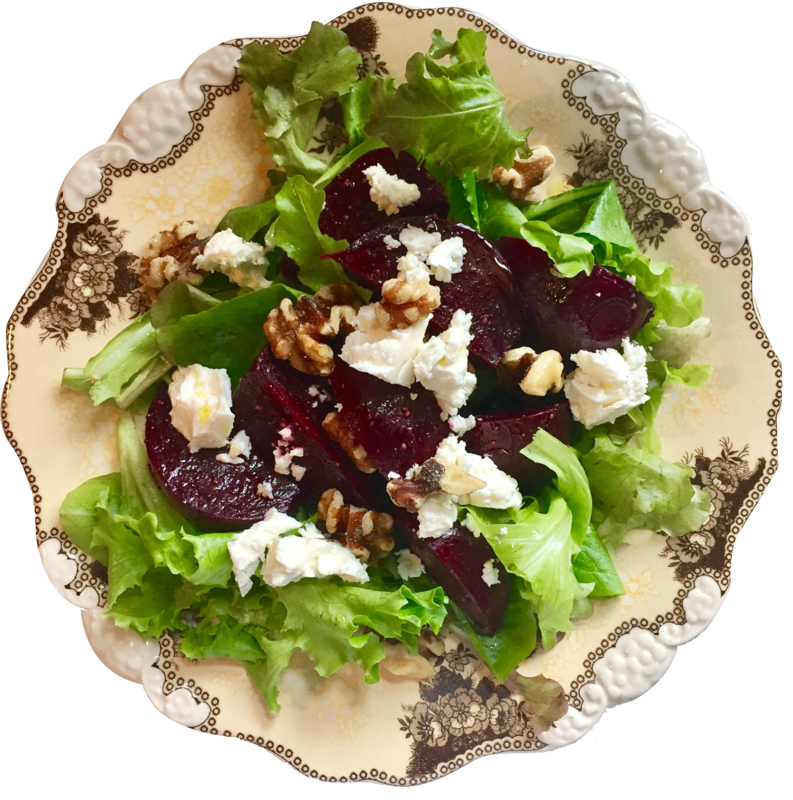 On of my favorite ways to eat beets is in a salad with crumbly cheese, fresh greens, olive oil, and toasted nuts or seeds. It’s so simple, but the flavors knock it out of the park every time. I should mention that this lends itself to adaptation well: feeling fancy-pants? Use golden and red beets. This dish also plays well into the fall. I like to roast the red onions and toss them in there for more rustic earthiness. Once you have everything at your fingertips, begin by making a bed of greens, followed by the beets and red onion. Drizzle on the EVOO and vinegar. Season with Salt and pepper. Top with crumbles cheese and toasted nuts or seeds, if using. 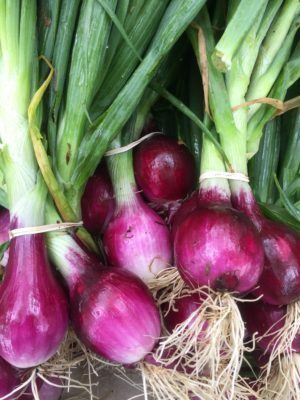 As summer kicks into full swing across the Northeast, farm fresh products are coming into season, and farmers’ markets throughout the region are gearing up to provide fresh, local, affordable farm products to consumers. 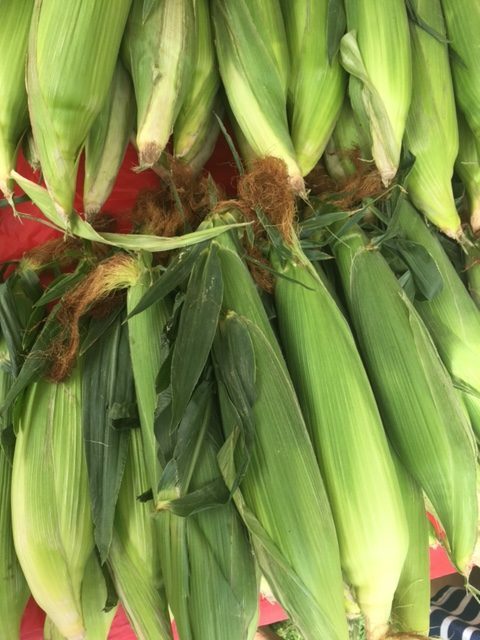 To support these important channels for Northeast farmers to reach consumers, Farm Credit East recently provided $1,000 grants to eight farmers’ markets and organizations to aid outreach efforts. Of the eight grants Farm Credit East provided, five of the recipients will use the funds for innovative programs to reach food insecure veterans, while others will use the funds for promotion of farmers’ markets or to support Supplemental Nutrition Assistance Program (SNAP) benefits. This is the time of year when local fruits, vegetables and other farm products are in abundance, so celebrate Northeast agriculture by visiting your local farmers’ market. If you’re unsure of where to find the nearest farmers’ market, roadside stand, winery or other retail farm operation, check out Farm Credit East’s Farm Fresh Guide for a listing of resources to find locations throughout Farm Credit East’s seven-state territory of Connecticut, Maine, Massachusetts, New Hampshire, New Jersey, New York and Rhode Island. 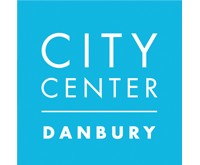 CityCenter Danbury will be hosting a Farmers’ Market every Saturday from June 24th through October 21st at Danbury Green from 10 am to 2 pm. 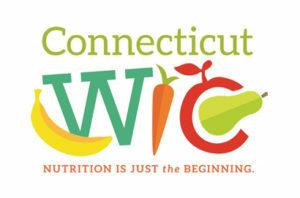 Held by the Danbury Farmers’ Market Community Collaborative (DFMCC), this event “enables everyone to share in the excitement and benefits of fresh local fruits, vegetables, specialty food items, music and special events.” The event will feature live music; nutrition, health, and fitness activities; and, of course, fresh food from vendors all over Connecticut. If you are interested in applying to be a vendor, click here. 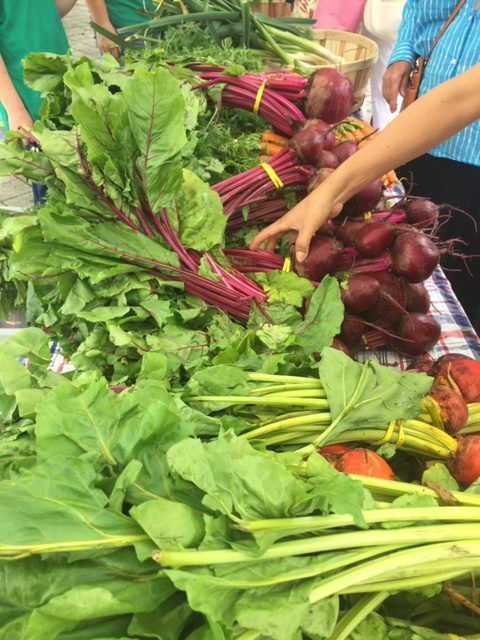 Better Health through Better Food aims to use the Danbury Farmers’ Market as an opportunity to provide better access for all Danbury residents to fresh food, promoting nutrition while giving families a more financially-friendly health food option. To create a healthier community is at the heart of the event’s mission, and that starts with making health food more accessible. 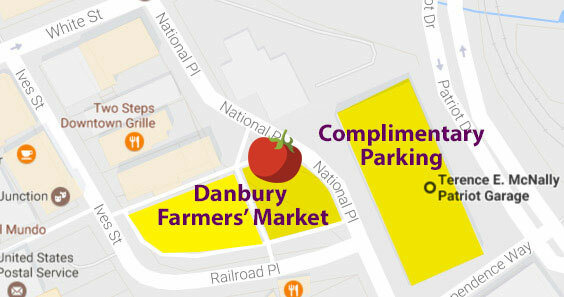 Click here for further information on this years Danbury Farmers’ Market. 2017 Giving Day and Danbury Farmers’ Market! Your donations help us bring affordable access to local fresh food to those with limited resources. The mission of the Danbury Farmers’ Market Community Collaborative is to provide Affordable Access to Local Fresh Food – thus all of our programs – and sustainability of CT farms. 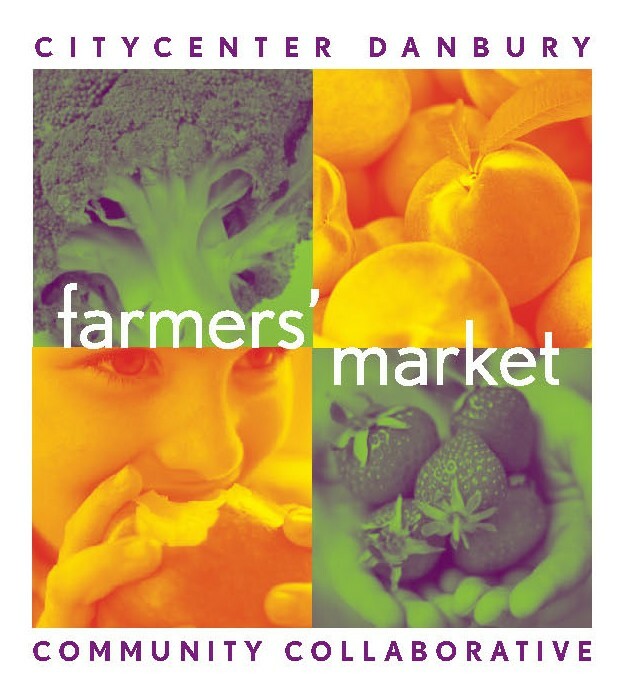 Every Saturday, from the end of June through the end of October, the Danbury Farmers’ Market Community Collaborative (DFMCC) enables everyone to share in the excitement and benefits of fresh local fruits, vegetables, specialty food items, music and special events. 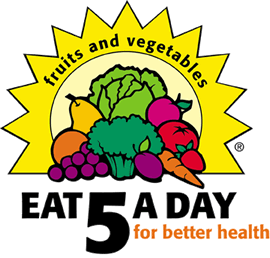 Obesity and poor nutrition at all ages, underlying factors in most chronic diseases are strongly associated with the inadequate intake of fruits and vegetables. Those with limited resources tend to purchase less fruits and vegetables. Through direct cash incentives at the market, the DFMCC continues to attack disparities in food purchasing power. Research shows that 79% of the project participants increased their intake of fruits and vegetables. Striving to provide equitable access to fresh food for all Danbury area residents, and promote health and nutrition, the collaborative of more than 30 community stakeholders, works to both enable those now excluded by limited resources to purchase fresh, local food at the Danbury Farmers’ Market and enhance the market experience for all. Healthy shoppers, healthy vendor profits and a healthy local economy are the goals. At its core, Better Health through Better Food is a community-wide health and nutrition enhancement and engagement campaign, a sustainable agriculture initiative, and an economic development strategy. For those with limited resources, providing additional cash (purchasing power) is the best incentive to increase buying of local fresh fruits and vegetables. Using a market coin system, DFMCC enables Supplemental Nutrition Assistance Program (SNAP, formerly know as Food Stamps) recipients to use their benefits at the market and matches up to $15 per market to buy nutritious food. DFMCC also matches up to $9 per market for Seniors and Women, Infant & Children’s program (WIC) recipients using Farmers’ Market Nutrition Program Vouchers (FMNP). For those not receiving government food assistance, Fruit and Veggie Certificates are available through 2 community health centers.